This is one of those occasions when I simply run out of superlatives. On Monday night 29th October 2018 I set up my William Optics 158 mm F/7 apochromatic refractor in my back garden and purposefully set out to find the carbon star NC 4 in the extreme northern part of Andromeda. In fact the star is very near the border of Cassiopeia. 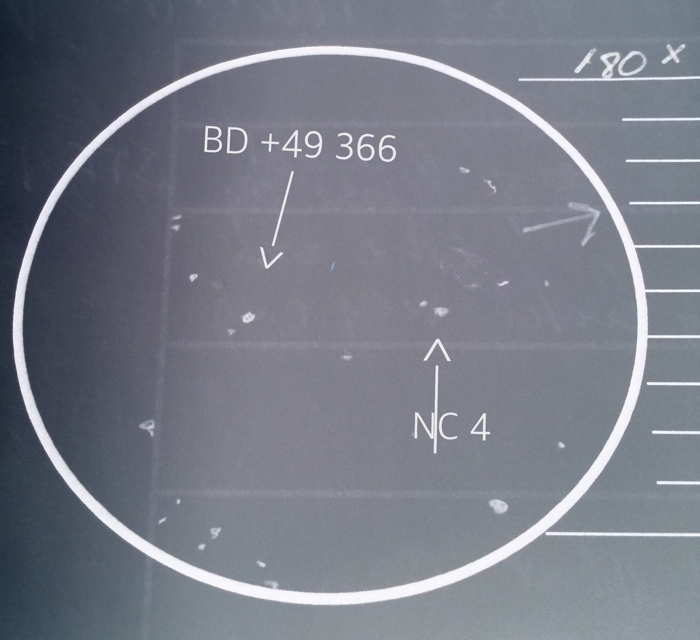 I started my journey from the beautiful binary Almach in my William Optics 70 mm guidescope at 11X . Starhopped my way up to mag 5 Chi Andromedae. Then northwards up to Omega and Xi Andromedae and finally came to 4.3 mag Phi Andromedae. About 4 degrees northeast I came to a 6.5 mag star HD 8160. Directly south of this star I came across a 6 star asterism with magnitudes varying from 10.9 down to 12.3 magnitude in my main scope. Right next to these stars I see a good strong orange carbon star NC 4 at 112X. I increased my magnifications to 167X and the star truly has a very good orange hue. I decided to increase my powers even further; because on my Guide 9.1 DVD NC 4 is shown as a double star. At 225X and 280X I was completely astounded to see a 11.7 magnitude star right next to NC 4! Its designation is 3UC 280-021968. That secondary star had a slight red tinge which I saw at 280X. These stars are faint. There is no doubting that. NC 4 has a magnitude of 9.6. Unfortunately www.stelledoppie.it does not appear to have a designation. But to me this is a most remarkable double star!! I have since worked out that the 2 stars are 10 arc seconds apart. NC 4 is my 22nd carbon star in Andromeda and my 68th overall. In closing, I would like to thank Eric (Cildarith) for bringing my attention to NC 4. It has been worthwhile to observe this most excellent gem for the 1st time. Thank you for reading. Comments are most welcome. Edited by flt158, 29 October 2018 - 05:53 PM. Aubrey, sounds as if you've become quite a collector of Carbon stars. This one sounds interesting, especially given a companion; though too far North from my Southern latitude to be observed. If the separation is around 10 seconds, and with the faint magnitudes, that would explain why it doesn't have a double star designation. Espin, Jonckheere etc didn't record every pair they came across, they still had separation preferred limits at fainter magnitudes; and of course they missed some pairs. If these two stars turn out to have similar proper motions and parallaxes then they could be a newly discovered pair, similar to those recently mentioned here by RadioAstronomer. The Gaia Data Release 2 might have that data. Not guaranteed, as some stars listed therein lack data on PM and parallax. Great narrative and catch Aubrey - thanks for sharing it. I don't see NC anything in SkySafari Pro. I don't see NC 4 And when I do a Google search. Where is there information on this carbon star? 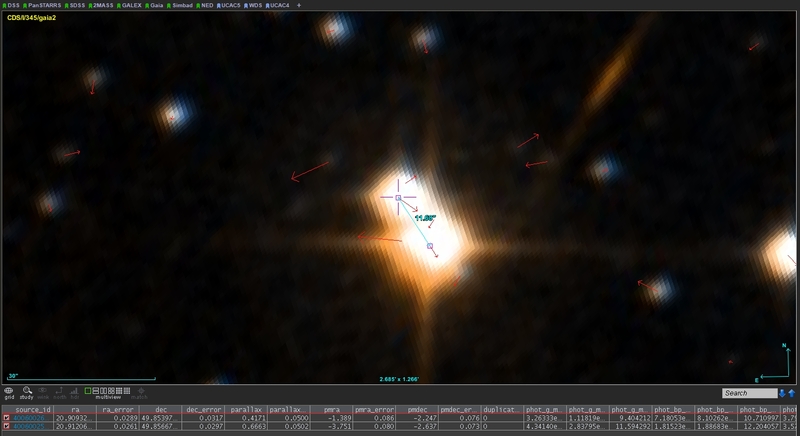 By the way, I've observed 66 carbon stars with my Canon 10x42 IS ... but not NC 4 And! Edited by Sarkikos, 30 October 2018 - 08:10 AM. You might try the other alternative designation: 3UC280-21965 for the primary. Unfortunately I have no other options for you at present. Thank you, Fred 1871, for your feedback. Your contributions make a lot of sense as always. I agree with your information entirely. It is possible that the 2 stars are not a true binary. They might be part of an optical double system. However let me remind each of you that I cannot take all the credit. That's because Fred (Cildarith) gave me a large list of carbons in Andromeda. And I still have a few more to go. And it is highly likely I will be sharing them on the Observational Astrophysics Forum. So please keep an eye on that. Thank you. Unless of course there are still more double carbon stars in this amazing constellation. I thank everyone for all their "likes" for my original article. A search for "3UC280" in SkySafari Pro comes up "Not Found." 3UC280-21965 and 3UC280-021968 do not show in a Google search. How do others find out about these objects? According to Google, SSP and even Stelle Doppie, they don't exist. Do many observers use Guide? I don't have it. This is the first time I've heard about it. Edited by Sarkikos, 30 October 2018 - 10:06 AM. Is there a reason for so many carbons in Andromeda or is this just a coincidence? I enjoy tracking the carbon stars down, but am limited to about 9.5 mag. I do have another suggestion regarding the location of this carbon double star that might just work. Try entering in the Right Ascension and Declination on Sky Safari. See if that works and I hope you will find it on your programme. Please do fill us in with your results. Andromeda is quite large constellation. It covers 722 degrees in the sky. Therefore there is plenty of room within its boundaries for many celestial objects. So do please have fun seeking some of its carbon stars. There are quite few brighter than 9.5 mag. Here is a list with their designations and magnitudes. 1. SU And: 8.0 to 8.5. 2. VX And: 7.8 to 9.3. 3. UY And: 7.4 to 12.3. 4. ST And: 7.7 to 11.8. 5. VY And: 9.6 to 11.8. 6. EW And: 8.8 to 9.4. See how you get on with those, Ed. And please share with us your experiences. Edited by flt158, 30 October 2018 - 05:02 PM. Screenshot from Sky Safari. Coordinates are a little different, but the difference is small. Not unexpected if the OP’s coordinates are a few years old. The star here has a B-V of 3.5 and a close 11” mag companion with only a Gaia designation- no spectral info. Some of them are variables. Although they’re headed in broadly the same direction, I think the difference in parallax would suggest there’s a lot of distance between them. Thank you for your help, Ardent. But unfortunately that is not quite the correct star. It is very near to where we are checking out. TYC 3273-0827-1 is about 15 arc minutes west of 3UC280-021965 (NC 4). But I do thank you for your contribution. Edited by flt158, 30 October 2018 - 05:05 PM. I have just fixed that mistake, mvas. When giving co-ordinates, it's essential to indicate whether they're J2000 or updated for precession to 2018. This has turned up previously as a problem for identifying objects. Various software programs give current co-ordinates by default. Eighteen years on from the J2000 standard epoch, the difference can be significant. A= 7,800 LY B= 4,800 LY a difference of 3,000 LY. This along with the very different PM values show that these stars are not connected in any way. For those who are having difficulty locating NC 4, please allow me to give you precise details as to how to locate it. Let us ignore the Right Ascension and Declination coordinates. These appear to confuse the whole issue entirely -as Fred 1871 has pointed out. I am sure you can find 4.3 magnitude Phi Andromedae on your software maps. So I shall start there. Sweep north northeastwards by 4 degrees to 6.5 magnitude HD 8160. Then go southeastwards by 24 arc minutes to mag 9.6 NC 4 or C* 3323 or 3UC280-021965 and admire its orange hue. There is a 9.5 magnitude white star TYC 3273 183 to its east which you will notice that that star is slightly brighter to be sure. In fact, if that star is on your software, you will have no trouble seeing the carbon star right next to it. Increase your magnification beyond 200X and you will notice that it is an optical double star as ssmith has just pointed out above with magnitudes 9.6 and 11.7. 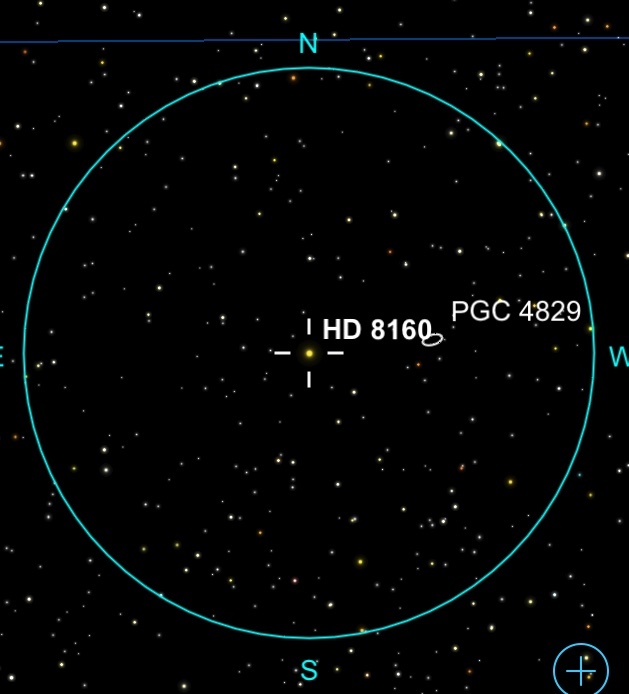 I made a chart of HD 8160 with a radius circle of 30 arc-mins. 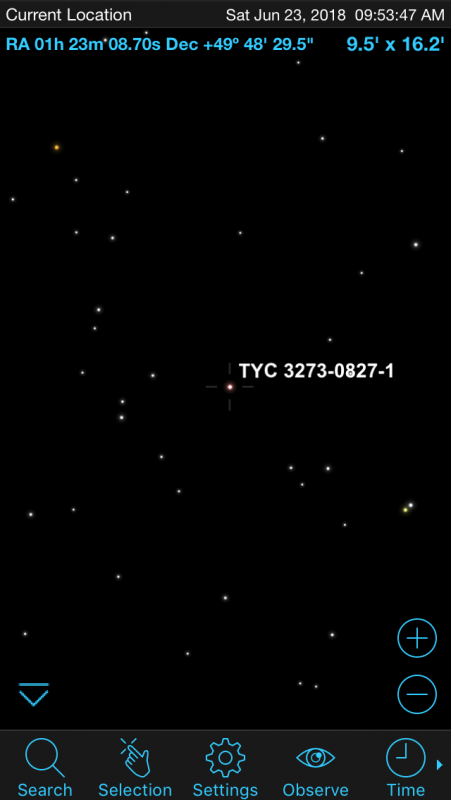 I am unable to locate the TYC star at the given distance and direction. If you can point out which star , or better a screenshot, I’ll try to observe it this weekend. It is good that you have your map centred on HD 8160. And that your aperture circle of 30' is centred on it. On the lower left you have a right angled triangle of stars within your circle. . The carbon star is lower right of the lower right hand star of that triangle. There is a fainter star to the right of it. Lower right of these 2 stars is a 6 star asterism. Therefore NC 4 or C* 3323 or 3UC280-021965 is in the 8 o'clock position within your circle. I must admit our carbon star appears white in your diagram. This might be a problem for you when figuring out its precise location. But in your telescope it will appear orange. And then you may have fun seeing the secondary of 11.7 magnitude. I wish you the very best, Ray. Here is a rough sketch made Saturday evening. Conditions : clear , cold , damp. Transparency good, seeing fair/poor. Scope 18” Dobsonian at 180x. Im going to estimate the color index at >2.0 and less than <2.5. Let me offer you sincerest congratulations, Ray, for your successful observation of NC 4. I am especially pleased you sighted its orange colour -even though that colour is not in your sketch. Also to the left of NC 4 I realise you also have the optical companion 3UC280-021968 some 10 seconds away in your sketch. That star appears to have a slight red tinge. And I do agree with your colour index for the primary. It's when we "discover" such gems in our night skies we enjoy the universe all the more! Over here in Ireland, the weather is making observing very difficult. Plus we have strong winds today Friday. I am still waiting for a further opportunity to seek out the last 3 carbons in Andromeda. It has been 8 nights since I have had a clear sky. All the best from Aubrey. I don't see NC anything in SkySafari Pro. I don't see NC 4 And when I do a Google search. Try SIMBAD. Also designated as HD 10097 and SAO 110028. It is about .8 degrees SW of mag 4.4 nu Psc (HD 10380). Edited by BillP, 09 November 2018 - 06:08 PM. Your most recent Sky Safari map is not quite spot on. Your sketch is more correct. What's important to point out is that GSC 3273-0911 is another red star which is west of the optical double. Please try zooming in on Sky Safari on that star. The magnitude of GSC 3273-911 is +12.55 and it is shown on Guide 9.1 DVD. Therefore I can see all 3 stars on my DVD. So from east to west we have 3UC280-021968 (mag 11.7), then 10" away is 3UC280-021965, and finally, GSC 3273-911. This latter star is 80" away from NC 4. Originally I was only concentrating on the optical double, which includes NC 4, through my eyepieces. However at no time did I see GSC 3273-0911 through my Williams Optics 158 mm apo. Light pollution is a problem from my home. I do hope some others will report back on this remarkable area in Andromeda. I did some research and the NC designation is from a survey of new carbon stars by C.B. Stephenson at the Warner and Swasey Observatory (Cleveland, OH) in 1985; hence NC = "New Carbon Star". I have found several values for the visual magnitude of NC 4 (10.2, 11.4). The visual magnitude of the companion I calculated from a J-K magnitude conversion. I do greatly admire your images, Steve, as ever. Thank you for this very special one. I wonder if NC 4 is a variable in magnitude carbon star. That is if NC 4 is the brighter star. Do you think you have labelled it correctly? On my Guide 9.1 DVD that designation does not appear at all. The 9.6 mag star has a long winded designation of 3UC 280-021965. Whereas you have discovered its magnitude varies from 10.2 to 11.4. I'm asking this because Eric (Cildarith) is discussing that very issue with me. 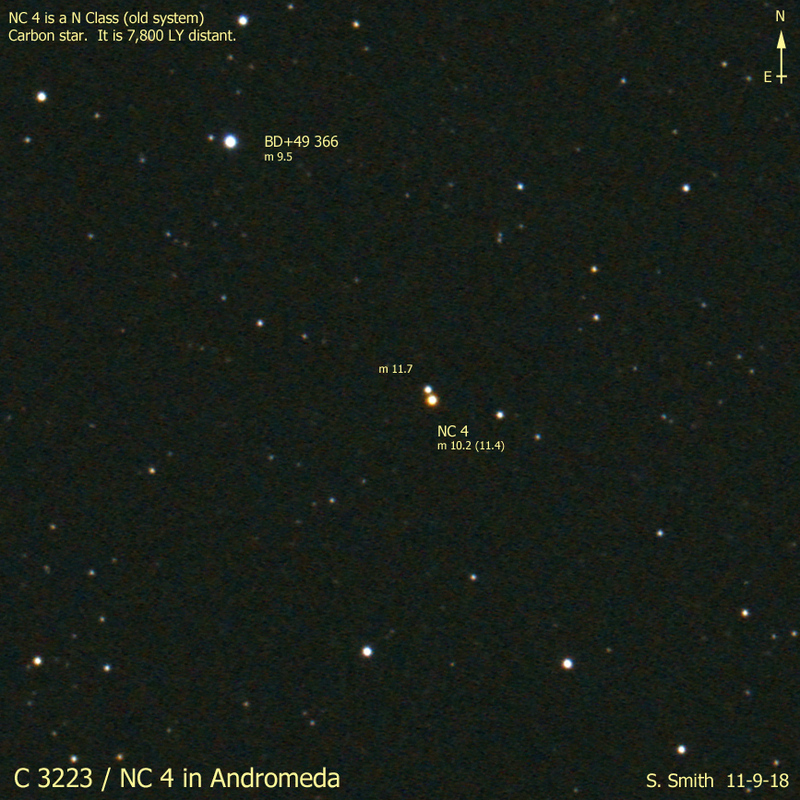 When I go to www.aavso.org the variable star website, it does not recognise NC 4. I appreciate your help on that one, Steve -or anyone else for that matter. The optical B component is 11.7 alright. Its designation on Guide 9.1 is 3UC280-201968.